The Shell Factory and Nature Park in Fort Myers, Florida celebrates 75 years as Southwest Florida’s number one tourist destination! 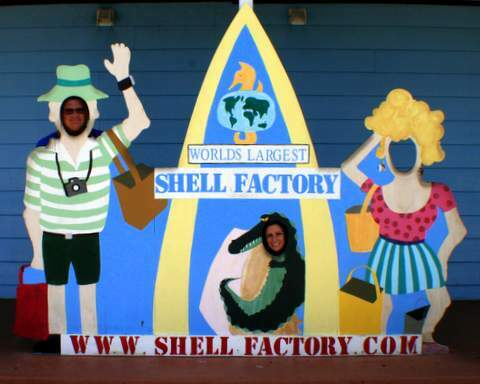 Located right off of Tamiami Trail, the Shell Factory is an easy stop for any traveler wanting a unique experience. With places to eat, shop, play and relax, the Shell Factory is a great place to take the family because there is something for everyone. The many attractions both indoors and outdoors will provide you and your family hours of fun! For the shopper, there is the Shell Factory Retail Store which has a huge selection of shells, coral and beach-themed souvenirs. Also inside is the festive Christmas Store which is open year-round and has a beautiful selection of holiday-inspired collectables. Both men’s and women’s jewelry can be found in each store as well as other great gifts for people of all ages. For the hungry visitor, stop by Captain Fishbones for adelicious lunch or dinner prepared by Chef Mike. The All-You-Can-Eat Shell Factory Fish Fry is every Tuesday, Wednesday and Friday. If beef is what you’re craving, stop in on Thursday when the special is Babyback Ribs. You can also enjoy a cool beverage at the Swamp Bar or Dog Bones Café. The Little Matey menu is also available for little tummies. Speaking of little tummies, while the adults are shopping, the kids can have fun in the Game Room and Arcade or grab a soda and relax at the Betty Boop Café. Families will love strolling around the Shell Factory Nature Park where over 350 live animals live in their natural habitats. Here you will see everything from alligators, to snakes, to birds, even to baby goats. Curious kids and adults can visit the ECO LAB andTOUCH CENTER where they can get up close to a variety of creatures. There is also a Petting Farm which young kids especially enjoy! When I stopped by, I was able to feed a bottle of milk to a baby goat. Another family was there feeding other goats at the same time I was and hearing their little girl giggle with delight was priceless! After visiting with all the animals the kids can use up all their remaining energy at the Shell Factory Fun Park. There kids can spend hours playing Mini Golf, Bumper Boats, Water Wars, Paddle Boats and even Shell Factory’s very own Mining Operation. If you’re traveling with Fido don’t fret! Shell Factory also welcomes your furry four-legged friends (except for Captain Fishbones and the Nature Park, where dogs are not allowed.) Doggy Heaven is a special dog park that’s home to both Suncoast DockDogs and the SW Florida Weiner Dog Club. There’s even a free agility course open to the public daily. For the spiritual K-9, Doggy Church is held every Sunday at 12:30pm. The Shell Factory and Nature Park has something to offer to families of all ages. If you’re traveling to Southwest Florida, make sure you plan on stopping by! The Shell Factory’s Retail Store hours are Monday-Sunday from 9am to 7pm. Captain Fishbones hours of operation are from 11am - 8pm. The Nature Park is open from 10am - 5pm. The Fun Park is open from 10am - 6pm.